For ages I’ve wanted to start making quilts and patchwork projects inspired by my favorite children’s book illustrations without overtly using prints from children’s books, like the Eric Carle collections. A couple of months ago I bought a set of Michael Miller’s Gray Citron and Plane Jane Gray fat quarters because the colors so reminded me of one of my favorite books of 2008, The House in the Night. I talk about this book a lot, and I use it with my students every chance I get. I love the poetry, I love the images. It’s one of those books I can read over and over again and constantly be soothed by, very much the way Goodnight Moon was my constant go-to source of comfort as a child. This has become like my modern Goodnight Moon. 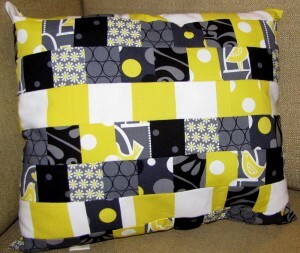 Tomorrow is the April meeting of the Philly Modern Quilt Guild, and our challenge was to bring a pillow to show off. Since these colors work in my living room, today I decided to finally make my first project inspired by a book and tackle a home project at the same time. And it was a really comforting project after a crazy week. I made up this version of a brick pattern, which involved some amusing improvisation. The pillow is very understuffed and an odd size (16″ x 13.5″), but I love it. The yellow polka dots with the dark background remind me of the moon, and even the birds make me happy and remind me of the book. I’ve put together a tutorial for this since it came together quickly and was so much fun. Check it out for many more pictures of how this was made. I have a lot of this fabric leftover, including more birds and an owl print I haven’t touched yet. So I may make something to hang up or use in the library when actually talking about this book.